September 22, 2014 – DOHA: Hamas has pleaded with the Islamic world to extend a helping hand in rebuilding Gaza which is left destroyed by Israel in the recent war. Every Muslim nation on earth must contribute to the rebuilding effort in Gaza, said Hamas’ charismatic leader Khaled Meshaal. He, however, dared Israel again yesterday and said the war with the Zionists will not be restricted to Gaza alone but will now be fought in Jerusalem and West Bank. 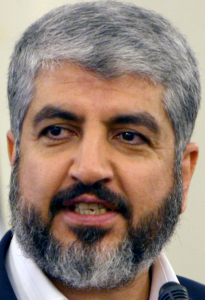 ‘We cannot at any cost separate Jerusalem and West Bank from the Palestinian resistance,’ thundered firebrand Meshaal. Speaking at an event to celebrate Hamas’ victory over the Zionists in the recent Gaza war, Meshaal said Palestinian unity was ‘our’ duty and political differences cannot undermine it. The celebrations were organised by International Union of Muslim Scholars (IUMS) headed by noted cleric Dr Yousuf Al Qaradawi. Meshaal said he welcomed the union’s call for the Palestinian resistance to continue and its insistence that Palestinian unity should not be compromised at any cost. The people who earlier pelted stones in resistance and gradually took to guns and missiles are capable of taking the war with the Zionists to the West Bank and winning it, said Meshaal. On Al Qassam Battalion of Hamas that fought and won the Gaza war, Meshaal said what it has achieved is nothing short of a miracle. Praising IUMS, he said yesterday’s event held by them was a symbol of Hamas’ partnership with them. The most obvious statement of important by Khaled Meshaal is the thread to extend armed conflict to Jerusalem and the West Bank which should expose as false the notion that the recent conflict was fought over Israeli policies toward Gaza. Less obvious are Meshaal’s statements about the International Union of Muslim Scholars (IUMS) which was was launched on July 11, 2004 in conjunction with a visit by Global Muslim Brotherhood leader Youssef Qaradawi to London for a meeting of the European Council for Fatwa and Research. Qaradawi is the IUMS President while many prominent individuals tied to the Global Muslim Brotherhood and/or Hamas serve as IUMS Trustees including Rachid Ghannouchi, leader of the Tunisian Muslim Brotherhood, and Jamal Badawi a leader in numerous US Muslim Brotherhood organizations. Both individuals are widely characterized as “moderates” despite their problematic histories. If the IUMS has a partnership with Hamas, as Khaled Meshaal stated above, it would seem that IUMS officials Ghannouchi and Badawi are part of that partnership. Khalid Meshaal’s statement that “Jihad through word is more important than the jihad waged through arms” is also significant as it acknowledges that Hamas and the Global Muslim Brotherhood have been waging a political war against the State of Israel in conjunction with its Western allies. For a report on the Hamas/Muslim Brotherhood political “Jihad”, go here.